You can click on this link to see my photo. (I'm the handsome gent on your right.) If you click on this link you can see an action shot of me teaching. I'm lunging, and my student is parrying. 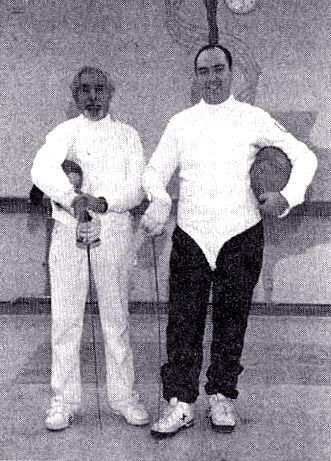 Governing body for fencing in the United States. See also the link for Fencing: A Modern Sport for good overview information regarding the sport generally. This will take you to the United States Fencing Coaches' Association web site. This replaces the prior USFA Coaches College. Interesting fencing web sites from the United States and around the world. Personal and club fencing-related web pages that caught my eye for interesting information or artwork. The Fencing Collector A really interesting site for fencing enthusiasts, where fencing-related items can be bought, sold, or traded. Clubs around the United States. Locations of various clubs around the U.S. Sacramento, CA included..... A few interesting web sites are included as well. Excellent resource for finding clubs, tournaments, etc. Check out the Intro to Fencing, and the online fencing drills. In a related theme to fencing lessons/online drills, check out Salle d' Escrime for online fencing lessons. Nicely done site. A compilation of information on all the subjects that are useful to fencers of all experience levels. A very interesting site. 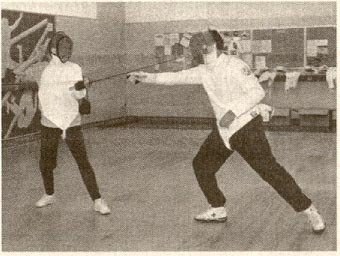 Great collection of fencing-related links. Swedish site. Artwork from various sources, and now a fencing screensaver. Some of my own photography is included here. Online fencing magazine articles, from the "In Ferro Veritas" web site. Resources for classical fencing and historical swordsmanship. Regional and Continuing Education -- Fencing Course. If you click on this link you can see an action shot of me teaching. I'm lunging, and my student is parrying. This page last modified November 4, 2007. My fencing page won an award.